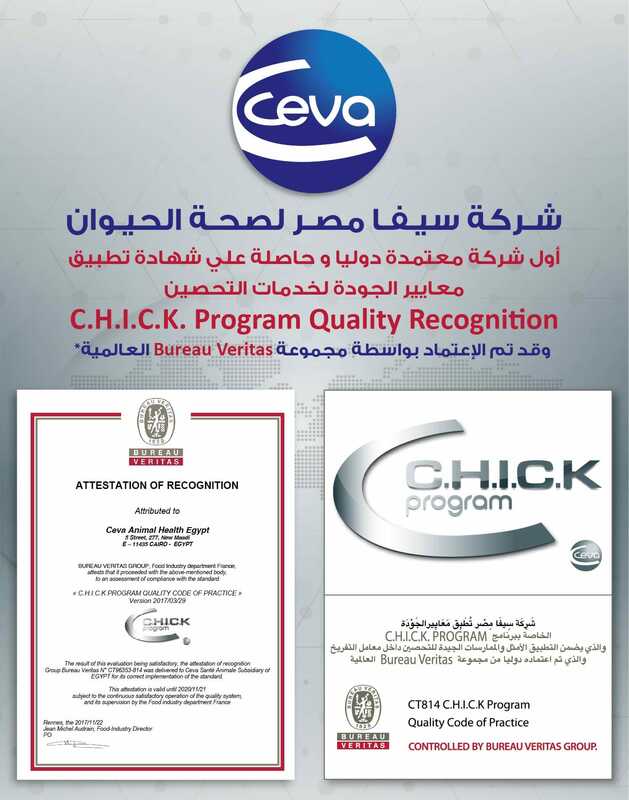 Ceva EGYPT is very proud to announce its national QUALITY RECOGNITION for its C.H.I.C.K Program from the international testing and certification company, Bureau Veritas Group. For the first time, a national services program delivered by an animal health company has received internationally recognized, quality approval ensuring that the quality services which we provide are of the highest possible international standard. To become Quality approved, Ceva Egypt Office underwent an evaluation process and a documentation review to show compliance to the standard which is today the C.H.I.C.K Program Quality Code of Practice. After that, audits done by the certification company Bureau Veritas Group in a customer hatchery, the poultry team obtained the “Attestation of Quality Recognition” for the implementation of the C.H.I.C.K Program hatchery vaccination services. This Quality Stamp for Ceva Egypt’s C.H.I.C.K Program recognizes that the policies, practices and procedures applied by our Vaccination Services & Equipment teams in the country ensure consistent quality in the services when going to customer’s hatcheries to monitor the quality of the vaccination. With this recognition, our clients can be confident that Ceva team is dedicated to maintaining the highest efficiency and responsiveness in achieving our ultimate goal – having all birds well vaccinated before being sent to farms for guaranteed client satisfaction.